Here is something quite difficult to find now - the skip attachment that fits on the back of a Massey Ferguson 65 tractor and can carry things like churns and bags. It was sold individually, with three churns, and had the catalogue number 1490 (see this page) and may have been included in the big Farm Set. Here it is, fitted to a very decent #50 Massey Ferguson 65 and has one churn that has survived with a sack. I think the sack probably belongs elsewhere but it seems right here so it’s staying for now. 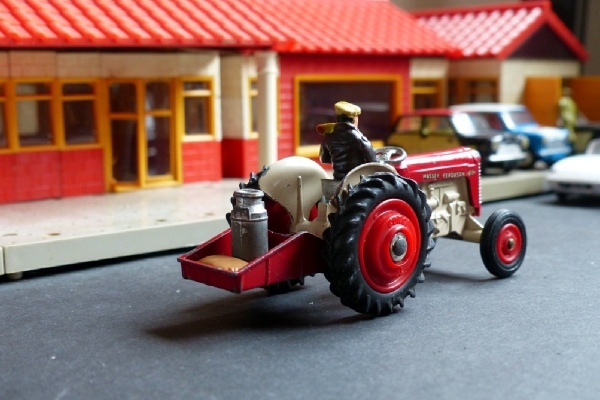 The tractor has plastic wheels and a silver seat and silver steering wheel so is one of the more common versions. The driver is original and really belongs with another set so is not included in this sale. The price is for the tractor and skip and contents. I am pretty sure these are quite scarce now and, whilst there may be a few around that someone is just discarding as a piece of unwanted and unbranded metal, they are actually quite valuable and worth hanging on to if you do find any.